The Steve Jobs washing machine from Miele – innovator approved! In the biography of Steve Jobs from Walter Isaacson, a few pages are dedicated to Steve’s habits at home. One of them was the desire to discuss and research every decision to make sure it was perfect. This happened on everything ranging from baby names to the type of washing machine they use. When they did settle on a name or product, they loved it, and that is exactly what happened with their laundry appliances. It turns out that the Americans make washers and dryers all wrong. The Europeans make them much better – but they take twice as long to do clothes! It turns out that they wash them with about a quarter as much water and your clothes end up with a lot less detergent on them. Most important, they don’t trash your clothes. They use a lot less soap, a lot less water, but they come out much cleaner, much softer, and they last a lot longer. 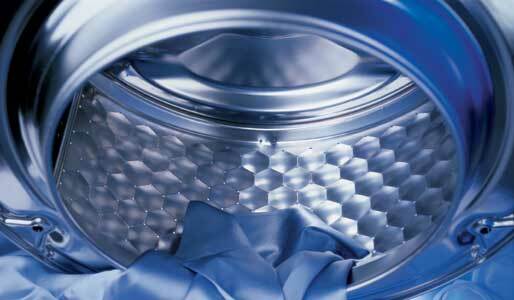 I did some research and it appears that a Honeycomb design is the key component of these washers. An independent study found that clothes washed using this method can last up to four times longer. The washing machines start at $1,300. Comparison of a traditional washing machine drum (left) and the honeycomb drum (right) while a towel is being washed. Posted on December 28, 2011 Author robotchampionCategories defaultTags clothes, dryer, honeycomb, innovation, laundry, miele, steve jobs, washing machine4 Comments on The Steve Jobs washing machine from Miele – innovator approved!